Only one online vote and a few dollars in prize money separated the top two vote-getters in the Fall 2018 University of San Diego Changemaker Challenge, but both projects have the potential to make a sustainable impact on campus and in the local community. Ernesto Truqui, a junior double major in Political Science and Economics and an employee in USD’s residential facilities area, and a group of students in the Master’s Entry Program in Nursing both earned in excess of $2,500 in the seventh annual Changemaker Challenge, which is run by the USD Changemaker Hub and receives financial support from the USD Alumni Association Board’s Alcala Fund. The Changemaker Challenge, which constitutes entrants submitting a two-minute video, had 109 entries — 11 individuals, 98 teams and 15 professors who embedded into their curriculum — for this year’s theme of Equity and Access: Education, Housing and Healthcare. Prize money, totaling $6,000, was spread among seven finalists and determined by the number of votes their videos received on the USD Changemaker Hub’s Facebook page. Changemaker Hub Faculty Director Michael Williams, PhD, also announced three special $1,000 awards for best on-campus idea, best off-campus idea and best original idea. Truqui’s video received 565 votes and $1,513.39 as well as the best on-campus idea for an additional $1,000. His idea is a desire to create an institutionalized process of furniture disposal that benefits the local community and reduces waste. Truqui, a project worker for two years, said USD throws out dozens of pieces of furniture every year due to quality standards. It is his hope that by bringing awareness to this issue, perhaps USD could implement a program where the furniture could be donated to people or organizations for re-use instead of being placed in a dumpster or a storage space. He said there is currently an effort being made through USD’s Mulvaney Center for Community Awareness and Social Action to transport more than 30 mattresses across the U.S.-Mexico border and to provide them to those who are currently living in a makeshift refugee camp near Tijuana. The second-place video, which received 564 votes, $1,510.71 and was named the best off-campus idea for another $1,000, was for a project that MEPN second-year students Lihini Kennawinna, Melissa Dempsey, Graham Wolfe, Natalie Marsh, Daniel Smith, Elizabeth Oliver and Jodi Barnes have been doing locally since this past summer. Their Changemaker Challenge proposal was centered on ensuring the wellness of a small group of asylum seekers, refugees and immigrants at Christ Ministry Center (CMC) in Normal Heights. Through the use of a validated mental health screening tool and education in mantram therapy, the group seeks to promote mental health to a group that’s vulnerable to trauma, toxic stress, anxiety and depression. These nurses from USD’s Hahn School of Nursing and Health Science are scheduled to partnering with USD’s School of Leadership and Education Sciences’ Counseling and Marital and Family Therapy. Dempsey recently wrote about the group’s experience with the CMC on the USD MEPN blog. Wolfe said the group hopes this experience can be a clinical site opportunity the nursing school will continue to offer for current and future MEPN students after this group graduates. While the top two vote-getters were present at Friday’s announcement of the Changemaker Challenge winners, five other finalists also received funding. San Diego Buddy Program was third with 285 votes and $763.39 for the three-person team of Emily Shepard, Alex Przybylo and Madison Orradre. This idea is a mentorship program for high school and elementary school children with learning disabilities. The program will take place between college students and high school/elementary school children and will match college students with a specific learning disability to high school/elementary school kids who have the same learning disability. Thus, students will get a specific program designed to them because their tutor will know what they are going through and how to give them help. Hope Through the Arts was fourth with 267 votes and $715.18 for the team of Murphy O’Brien, Madeline Mandanis, Morgan Summer and Danica Burgner. Their idea is an after-school program to create a safe space for homeless children. It would offer them a chance to change their outlook on life through the assistance of the arts. USD students would be mentors for the children. Glasses for Low Income Students was fifth with 216 votes and earned $578.57 for Amanda Matel, Jessica Wilson, Jake Benham and Aminata Dosso. For those without insurance, a pair of prescription glasses is around $600. Each year when people get new glasses, they tend to leave their old pair lying around. The group’s idea is to start a glasses drive by encouraging donations of old glasses to nearby elementary, middle and high schools in local low-income communities. Also, the program would provide inexpensive vision tests for these students. Standardized Yet Unfair was sixth with 187 votes and $500.89 in prize money for Kylie Bleakley, Alexandra Alessio, Shaylyn Becton and Joshua Breton. Their idea seeks to raise awareness of unequal access to standardized test preparation due to different levels of income across the country. The goal is to have USD students in the Master of Education program serve as volunteer tutors for the SAT/ACT tests at low-income schools in San Diego. It would be either an elective, an internship option or be a graduation requirement. Furthermore, the group also wants to launch an online platform in partnership with San Diego schools. Help a Hero Hub was the seventh with 156 votes, earning $417.86 for Julian-Ross Fernandez and Nika Khoroshi. Their idea is to create a mobile hygiene hub that incorporates employers who practice open hiring to help homeless veterans clean themselves up and get re-incorporated into the workforce. In addition to their vote-total prize money, this idea was named best original idea for an additional $1,000. The project fostered a collaboration between USD students, the Mulvaney Center and Urban Corps of San Diego, a certified local conservation corps and charter school whose mission is to provide young adults with a high school education, job training and community service in the fields of conservation and recycling. Like the USD Changemaker Hub Facebook page in order to view the seven USD Changemaker Challenge video finalists. 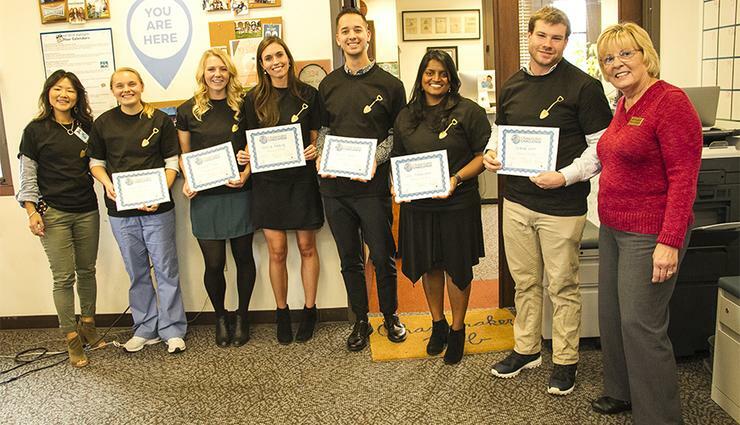 Second-year students in USD's Master's Entry Program in Nursing (MEPN) were one of the top vote-getters in the Fall 2018 USD Changemaker Challenge.